Dr Paul Harpur is the holder of a prestigious Fulbright Future Scholarship (click to see his Fulbright profile page) and joins a select cohort of TC Beirne academics who have been called to become Fulbrighters. Dr Harpur's project is jointly funded by The Kinghorn Foundation, Harvard University, Syracuse University and the University of Queensland and is entitled “Universally Designed for Whom? Disability, the Law and Practice of Expanding the “Normal User”. 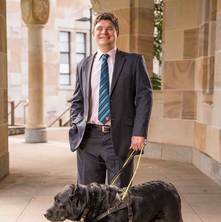 Harpur will use his Fulbright Future Scholarship to spend three months between the Burton Blatt Institute at Syracuse University and Harvard University to collect data and build relationships between Australian and US advocates and researchers involved with the development and promotion of design that is accessible to everyone in society, whether they be able or disabled. Harpur’s research project aims to combat ableism’s influence on human life, so that in the future different ability is not associated with disablement, but instead is accepted as a part of human diversity. Dr Harpur’s recent monograph, Discrimination, Copyright and Equality: Opening the E-Book for the Print Disabled (2017) Cambridge University Press analyses the interaction between anti-discrimination and copyright laws, in the international human rights and copyright jurisdictions, as well as in the national jurisdictions in Australia, Canada, the UK and USA. This work builds on international and domestic notions of digital equality and rights to access information. The core thesis of this monograph is that technology now creates the possibility that everyone in the world, regardless of their abilities or disabilities, should be able to access the written word. In addition to UQ's e-Space, references to 200+ of Dr Harpur’s publications can be found on his Google Scholar page. Further information can be found on his Linkedin page. Rights of persons with disabilities and Australian anti-discrimination laws: What happened to the legal protections for people using guide or assistance dogs? Developments in Chinese labour laws: Enforcing people with disabilities' right to work? Charity Law's Public Benefit Test: is legislative reform in the public interest? 'From Regulating the Employment Relationship to Regulating Work: Regulating OHS in Australia's Harmonised Work Health and Safety Act' . Is Corporate Social Responsibility In Labour Standards An Oxymoron? Mass loss of life and R2P: did the experiences from East Timor and Kosovo having a positive impact on the humanitarian crisis associated with the Sri Lankan Civil War? The International Labor Organization's Better Factories Project: Can Transnational Regulation of Labour Conditions Work?